Media - Welcome to Our Generation USA! YouTube Video about the First Amendment by Jeffrey Rosen of the National Constitution Center in conversation with Walter Isaacson of the Aspen Institute. ​Media (the singular form of which is medium) is the collective communication outlets or tools that are used to store and deliver information or data. It is either associated with communication media, or the specialized mass media communication businesses such as: print media and the press, photography, advertising, cinema, broadcasting (radio and television) and publishing. The term "media" in its modern application relating to communication channels is traced back to its first use as such by Canadian communications theorist Marshall McLuhan, who stated in Counterblast (1954): "The media are not toys; they should not be in the hands of Mother Goose and Peter Pan executives. They can be entrusted only to new artists, because they are art forms." Modern communication media now allow for intense long-distance exchanges between larger numbers of people (many-to-many communication via e-mail, Internet forums, and teleportation). On the other hand, many traditional broadcast media and mass media favor one-to-many communication (television, cinema, radio, newspaper, magazines, and also social media). Electronic media usage is growing, although concern has arisen that it distracts youth from face-to-face contact with friends and family. Research on the social engagement effect is mixed. One study by Wellman finding that “33% of Internet users said that the Internet had improved their connections to friends ‘a lot’, and 23% said it had increased the quality of their communication with family members by a similar amount. Young people in particular took advantage of the social side of the Internet. Nearly half (49%) of the 18- to 29-year-olds said that the Internet had improved their connections to friends a lot. On the other hand, 19% of employed Internet users said that the Internet had increased the amount of time they spent working in home” (Lee, Leung, Lo, Xiong, & Wu p. 377 & 378). Electronic media now comes in the forms tablets, laptops, desktops, cell phones, mp3 players, DVDs, game systems, radios, and television. Technology has spiked to record highs within the last decade, thus changing the dynamic of communication. The meaning of electronic media, as it is known in various spheres, has changed with the passage of time. The term media has achieved a broader meaning nowadays as compared to that given it a decade ago. Earlier, there was multimedia, once only a piece of software (application software) used to play audio (sound) and video (visual object with or without sound). Following this, it was CD (Compact Disc) and DVD (Digital Versatile Disc), then camera of 3G (Third Generation) applications in the field. In modern terms, the media includes all the software which are used in PC (Computer) or Laptop or Mobile Phone installed for normal or better performance of the system; today, however, hard discs (used to increase the installation capacity of data) of computer is an example of electronic media. This type of hard disc is becoming increasingly smaller in size. The latest inclusion in the field is magnetic media (magnetic stripe) whose application is common, in the fastest growing Information Technology field. Modern day IT media is commonly used in the banking sector and by the Income Tax Department for the purpose of providing the easiest and fastest possible services to the consumers. In this magnetic strip, account information linking to all the data relating to a particular consumer is stored. The main features of these types of media are prepared unrecorded (blank form), and data is normally stored at a later stage as per the requirement of its user or consumer. Media technology has made communicating increasingly easier as time has passed throughout history. Today, children are encouraged to use media tools in school and are expected to have a general understanding of the various technologies available. The internet is arguably one of the most effective tools in media for communication tools such as e-mail, Skype, Facebook etc., have brought people closer together and created new online communities. However, some may argue that certain types of media can hinder face-to-face communication and therefore can result in complications like identity fraud. In a large consumer-driven society, electronic media (such as television) and print media (such as newspapers) are important for distributing advertisement media. More technologically advanced societies have access to goods and services through newer media than less technologically advanced societies. In addition to this “advertising” role, media is nowadays a tool to share knowledge all around the world. The internet is a sustainable solution to overcome the “gap” between developed and developing countries as both will get a chance to learn from each other. Therefore, the internet can be a way to re-establish balance, by for instance enhance publication of newspaper, academic journal from developing countries. Consequently, media is a modern form of communication aiming at spreading knowledge within the whole world, regardless any form of discrimination. Media, through media and communications psychology, has helped to connect diverse people from far and near geographical location. It has also helped in the aspect of on-line or internet businesses and other activities that have an on-line version. ​All media intended to affect human behavior is initiated through communication and the intended behavior is couched in psychology. Therefore, understanding media and communications psychology is fundamental in understanding the social and individual effects of media. The expanding field of media and communications psychology combines these established disciplines in a new way. Timing change based on innovation and efficiency may not have a direct is correlation with technology. The information revolution is based on modern advancements. During the 19th century, the information "boom" rapidly advanced because of postal systems, increase in newspaper accessibility, as well as schools "modernizing". These advancements were made due to the increase of people becoming literate and educated. The methodology of communication although has changed and dispersed in numerous directions based on the source of its socio-cultural impact. Biases in the media that affects religious or ethnic minorities takes the form of racism in the media. Many of the media are controlled by large for-profit corporations who reap revenue from advertising, subscriptions, and sale of copyrighted material. American media conglomerates tend to be leading global players, generating large revenues as well as large opposition in many parts of the world. With the passage of the Telecommunications Act of 1996, further deregulation and convergence are under way, leading to mega-mergers, further concentration of media ownership, and the emergence of multinational media conglomerates. These mergers enable tighter control of information. Currently, five corporations control roughly 90% of the media. Critics allege that localism, local news and other content at the community level, media spending and coverage of news, and diversity of ownership and views have suffered as a result of these processes of media concentration. The organisation Reporters Without Borders compiles and publishes an annual ranking of countries based upon the organisation's assessment of their press freedom records. In 2013–14 United States was ranked 46th out of 180 countries, a drop of thirteen points from the preceding year. Starting in 2007, it has been questioned if media companies actually are related. Some media conglomerates use their access in multiple areas to share various kinds of content such as: news, video and music, between users. The media sector's tendency to consolidate has caused formerly diversified companies to appear less diverse in comparison with similar companies. Therefore, the term media group may also be applied, however, it has not yet replaced the more traditional term. Media cross-ownership is the ownership of multiple media businesses by a person or corporation. These businesses can include broadcast and cable television, film, radio, newspaper, magazine, book publishing, music, video games, and various online entities. Much of the debate over concentration of media ownership in the United States has for many years focused specifically on the ownership of broadcast stations, cable stations, newspapers and websites. A media proprietor, media mogul or media tycoon refers to a successful entrepreneur or businessperson who controls, through personal ownership or via a dominant position in any media related company or enterprise, media consumed by a large number of individuals. 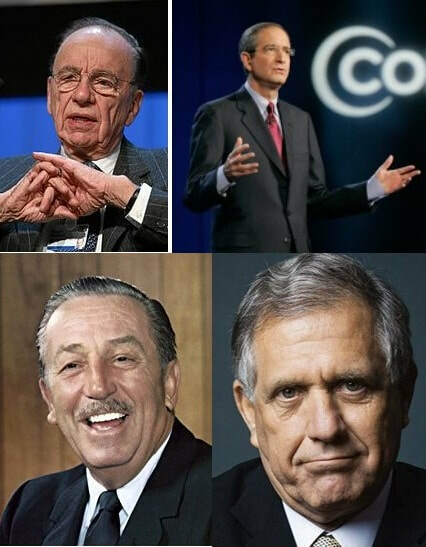 Those with significant control, ownership, and influence of a large company in the mass media may also be called a tycoon, baron, or business magnate. Social media creators and founders can also be considered media moguls, as such channels deliver media to a large consumer base. In the United States, newspaper proprietors first became prominent in the 19th century with the development of mass circulation newspapers. In the 20th century, proprietorship expanded to include ownership of radio and television networks, as well as film studios, publishing houses, and more recently internet and other forms of multimedia companies. Reflecting this, the term "press baron" was replaced by "media baron", and the term "media mogul" (or "Hollywood mogul" when applied to people specifically working in the motion picture industry, having actually spawned a similarly named computer game) was popularized in colloquial English. In modern relevance, social media sites need to be taken into account such as Facebook in relation to Mark Zuckerberg who is an extremely important media proprietor. 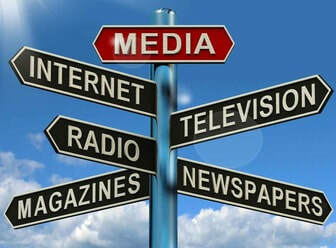 Media and technology play a significant role in mass media production. Media bias is the bias or perceived bias of journalists and news producers within the mass media in the selection of events and stories that are reported and how they are covered. The term "media bias" implies a pervasive or widespread bias contravening the standards of journalism, rather than the perspective of an individual journalist or article. The direction and degree of media bias in various countries is widely disputed. Practical limitations to media neutrality include the inability of journalists to report all available stories and facts, and the requirement that selected facts be linked into a coherent narrative. Government influence, including overt and covert censorship, biases the media in some countries, for example China, North Korea and Myanmar. Market forces that result in a biased presentation include the ownership of the news source, concentration of media ownership, the selection of staff, the preferences of an intended audience, and pressure from advertisers. A variety of watchdog groups combat this by fact-checking both biased reporting and unfounded claims of bias. A variety of scholarly disciplines study media bias. Many news outlets make no pretense of being unbiased, and give their readers or listeners the news they want, leading to what has been called post truth politics. According to reports released by the Federal Communications Commission (see below), traditional cable television subscriptions in the US peaked around the year 2000, at 68.5 million total subscriptions. Since then, cable subscriptions have been in slow decline, dropping to 54.4 million subscribers by December 2013. Some telephone service providers have started offering television, reaching to 11.3 million video subscribers as of December 2013. ​The Federal Communications Commission (FCC) is an independent agency of the United States government created by statute (47 U.S.C. § 151 and 47 U.S.C. § 154) to regulate interstate communications by radio, television, wire, satellite, and cable. The FCC works towards six goals in the areas of broadband, competition, the spectrum, the media, public safety and homeland security, and modernizing itself. The FCC was formed by the Communications Act of 1934 to replace the radio regulation functions of the Federal Radio Commission. The FCC took over wire communication regulation from the Interstate Commerce Commission. The FCC's mandated jurisdiction covers the 50 states, the District of Columbia, and the Territories of the United States. The FCC also provides varied degrees of cooperation, oversight, and leadership for similar communications bodies in other countries of North America. The FCC is funded entirely by regulatory fees. It has an estimated fiscal-2016 budget of US $388 million. It has 1,688 federal employees, made up of 50% males and 50% females as of December, 2017. "All Americans should have affordable access to robust and reliable broadband products and services. Regulatory policies must promote technological neutrality, competition, investment, and innovation to ensure that broadband service providers have sufficient incentives to develop and offer such products and services." "Competition in the provision of communication services, both domestically and overseas, supports the Nation's economy. The competitive framework for communications services should foster innovation and offer consumers reliable, meaningful choice in affordable services." "Efficient and effective use of non-federal spectrum domestically and internationally promotes the growth and rapid development of innovative and efficient communication technologies and services." "The Nation's media regulations must promote competition and diversity and facilitate the transition to digital modes of delivery." "Communications during emergencies and crisis must be available for public safety, health, defense, and emergency personnel, as well as all consumers in need. The Nation's critical communications infrastructure must be reliable, interoperable, redundant, and rapidly restorable." ​"The Commission shall strive to be highly productive, adaptive, and innovative organization that maximizes the benefits to stakeholders, staff, and management from effective systems, processes, resources, and organizational culture." (2008). The term is often used for large news conglomerates, including newspapers and broadcast media, that underwent successive mergers in many countries. The concentration of media ownership has raised concerns of a homogenization of viewpoints presented to news consumers. Consequently, the term mainstream mediahas been widely used in conversation and the blogosphere, sometimes in oppositional, pejorative, or dismissive senses, in discussion of the mass media and media bias. According to philosopher Noam Chomsky, media organizations with an elite audience such as CBS News and The New York Times are successful corporations with the assets necessary to set the tone for other smaller news organizations which lack comparable resources by creating conversations that cascade down to smaller news organizations using the Associated Press and other means of aggregation. An elite mainstream sets the agenda and smaller organizations parrot it. In the United States, movie production is known to have been dominated by major studios since the early 20th Century; before that, there was a period in which Edison's Trust monopolized the industry. In the early twenty-first century the music and television industries was subject to media consolidation, with Sony Music Entertainment's parent company merging their music division with Bertelsmann AG's BMG to form Sony BMG and Tribune's The WB and CBS Corp.'s UPN merging to form The CW. In the case of Sony BMG there existed a "Big Five", later "Big Four", of major record companies, while The CW's creation was an attempt to consolidate ratings and stand up to the "Big Four" of American network (terrestrial) television (although the CW was actually partially owned by one of the Big Four in CBS). Cablevision, or some combination thereof. ​There may also be some large-scale owners in an industry that are not the causes of monopoly or oligopoly. Clear Channel Communications, especially since the Telecommunications Act of 1996, acquired many radio stations across the United States, and came to own more than 1,200 stations. However, the radio broadcasting industry in the United States and elsewhere can be regarded as oligopolistic regardless of the existence of such a player. Because radio stations are local in reach, each licensed a specific part of spectrum by the FCC in a specific local area, any local market is served by a limited number of stations. In most countries, this system of licensing makes many markets local oligopolies. The similar market structure exists for television broadcasting, cable systems and newspaper industries, all of which are characterized by the existence of large-scale owners. Concentration of ownership is often found in these industries. Journalism – investigation and reporting of events, issues and trends to a broad audience. Though there are many variations of journalism, the ideal is to inform the intended audience. Concepts of the appropriate role for journalism vary between countries. In some nations, the news media is controlled by government intervention, and is not a fully independent body. ​In others, the news media is independent of the government but instead operates as private industry motivated by profit. In addition to the varying nature of how media organizations are run and funded, countries may have differing implementations of laws handling the freedom of speech and libel cases. The advent of the Internet and smartphones has brought significant changes to the media landscape in recent years. This has created a shift in the consumption of print media channels, as people increasingly consume news through e-readers, smartphones, and other personal electronic devices, as opposed to the more traditional formats of newspapers, magazines, or television news channels. News organizations are challenged to fully monetize their digital wing, as well as improvise on the context in which they publish in print. Newspapers have seen print revenues sink at a faster pace than the rate of growth for digital revenues. ​Journalistic conventions vary by country. In the United States, journalism is produced by media organizations or by individuals. Bloggers are often, but not always, journalists. The Federal Trade Commission requires that bloggers who write about products received as promotional gifts to disclose that they received the products for free. This is intended to eliminate conflicts of interest and protect consumers. In the US, a credible news organization is an incorporated entity; has an editorial board; and exhibits separate editorial and advertising departments. Credible news organizations, or their employees, often belong to and abide by the ethics of professional organizations such as the American Society of News Editors, the Society of Professional Journalists, Investigative Reporters, or the Online News Association. Many news organizations also have their own codes of ethics that guide journalists' professional publications. For instance, The New York Times code of standards and ethics is considered particularly rigorous. When writing stories, objectivity and bias are issues of concern to journalists. Some stories are intended to represent the author's own opinion; others are more neutral or feature balanced points-of-view. In a print newspaper, information is organized into sections and the distinction between opinionated and neutral stories is often clear. Online, many of these distinctions break down. Readers should pay careful attention to headings and other design elements to ensure that they understand the journalist's intent. Opinion pieces are generally written by regular columnists or appear in a section titled "Op-ed", while feature stories, breaking news, and hard news stories are usually not opinionated. There are several forms of journalism with diverse audiences. Thus, journalism is said to serve the role of a "fourth estate", acting as a watchdog on the workings of the government. A single publication (such as a newspaper) contains many forms of journalism, each of which may be presented in different formats. Each section of a newspaper, magazine, or website may cater to a different audience. The rise of social media has drastically changed the nature of journalistic reporting, giving rise to so-called citizen journalists. In a 2014 study of journalists in the United States, 40% of participants claimed they rely on social media as a source, with over 20% depending on microblogs to collect facts. From this, the conclusion can be drawn that breaking news nowadays often stems from user-generated content, including videos and pictures posted online in social media. However, though 69.2% of the surveyed journalists agreed that social media allowed them to connect to their audience, only 30% thought it had a positive influence on news credibility. "Fake news" is deliberately untruthful information which can often spread quickly on social media or by means of fake news websites. It is often published to intentionally mislead readers to ultimately benefit a cause, organization or an individual. A glaring example was the proliferation of fake news in social media during the 2016 U.S. presidential election. Conspiracy theories, hoaxes, and lies have been circulated under the guise of news reports to benefit specific candidates. One example is a fabricated report of Hillary Clinton's email which was published by a non-existent newspaper called The Denver Guardian. 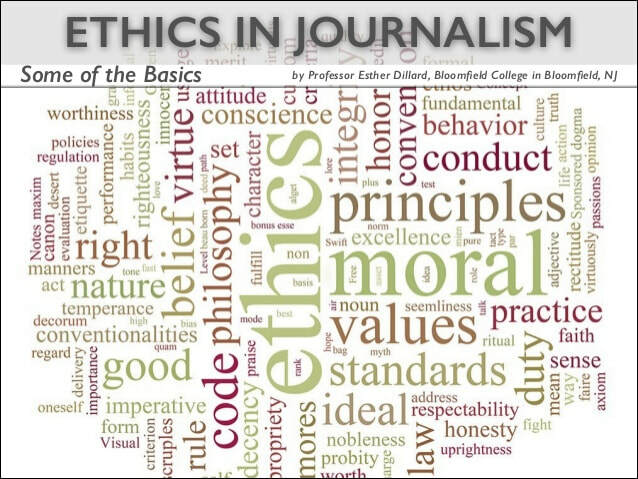 The principles of journalistic codes of ethics are designed as guides through numerous difficulties, such as conflicts of interest, to assist journalists in dealing with ethical dilemmas. The first is honesty: a journalist should not make up news or share news that give off wrong impressions. The second is independence: a journalist should avoid topics they have an interest in. The third is fairness: a journalist should not tell the truth if it is with bad intentions. The fourth is productiveness: a journalist should work hard to try to gather all the facts. The last value is pride: a journalist needs to be able to accept all credit for their work, bad or good. While journalists in the United States and European countries have led the formulation and adoption of these standards, such codes can be found in news reporting organizations in most countries with freedom of the press. The written codes and practical standards vary somewhat from country to country and organization to organization, but there is substantial overlap between mainstream publications and societies. The International Federation of Journalists (IFJ) launched a global Ethical Journalism Initiative in 2008 aimed at strengthening awareness of these issues within professional bodies. In 2013 the Ethical Journalism Network was founded by former IFJ General Secretary Aidan White. This coalition of international and regional media associations and journalism support groups campaigns for ethics, good governance and self-regulation across all platforms of media. Investigative journalism is a form of journalism in which reporters deeply investigate a single topic of interest, such as serious crimes, political corruption, or corporate wrongdoing. An investigative journalist may spend months or years researching and preparing a report. Investigative journalism is a primary source of information. Most investigative journalism is conducted by newspapers, wire services, and freelance journalists. Practitioners sometimes use the terms "watchdog reporting" or "accountability reporting". University of Missouri journalism professor Steve Weinberg defined investigative journalism as: "Reporting, through one's own initiative and work product, matters of importance to readers, viewers, or listeners." In many cases, the subjects of the reporting wish the matters under scrutiny to remain undisclosed. There are currently university departments for teaching investigative journalism. Conferences are conducted presenting peer reviewed research into investigative journalism. Julius Chambers of the New-York Tribune had himself committed to the Bloomingdale Asylum in 1872, and his account led to the release of twelve patients who were not mentally ill, a reorganization of the staff and administration, and eventually to a change in the lunacy laws; this later led to the publication of the book A Mad World and Its Inhabitants (1876). Nellie Bly is known for her record-breaking trip around the world in 72 days, in emulation of Jules Verne's fictional character Phileas Fogg, and an exposé for the New York World in which she faked insanity to study a mental institution from within. One of the largest teams of investigative journalists is the Washington-based International Consortium of Investigative Journalists (ICIJ) launched in 1997 by the Center for Public Integrity which includes 165 investigative reporters in over 65 countries working collaboratively on crime, corruption, and abuse of power at a global level, under Gerard Ryle as Director. Working with major media outlets globally, they have exposed organised crime, international tobacco companies, private military cartels, asbestos companies, climate change lobbyists, details of Iraq and Afghanistan war contracts, and most recently the Panama Papers and Paradise Papers. A "sack" is an edited set of video clips for a news story and is common on television. It is typically narrated by a reporter. It is a story with audio, video, graphics and video effects. The news anchor, or presenter, usually reads a "lead-in" (introduction) before the package is aired and may conclude the story with additional information, called a "tag". The radio industry has undergone a radical consolidation of ownership, with fewer companies owning the thousands of stations. Large media conglomerates such as Clear Channel Communications own most of the radio stations in the United States. That has resulted in more "niche" formats and the sharing of resources within clusters of stations, de-emphasizing local news and information. There has been concern over whether this concentration serves the public. The opposition says that the range of political views expressed is greatly narrowed and that local concerns are neglected, including local emergencies, for which communication is critical. Automation has resulted in many stations broadcasting for many hours a day with no one on the station premises. Television (TV) news is considered by many to be the most influential medium for journalism. For most of the American public, local news and national TV newscasts are the primary news sources. Not only the numbers of audience viewers, but the effect on each viewer is considered more persuasive ("The medium is the message"). Television is dominated by attractive visuals (including beauty, action, and shock), with short soundbites and fast "cuts" (changes of camera angle). Television viewing numbers have become fragmented, with the introduction of cable news channels, such as Cable News Network (CNN), Fox News Channel and MSNBC. United States stations typically broadcast local news three or four times a day: around 4:30–6 am, 11:30 or noon, 5 or 6 pm, and 10 or 11 at night. Most of the nightly local newscasts are 30 minutes, and include sports television and weather. News anchors are shown sitting at a desk in a television studio. The news anchors read teleprompters that contain local interest stories and breaking news. Reporters frequently tell their stories outside the formal television studio in the field, in a remote broadcast setting where Electronic news-gathering (ENG) techniques are used with production trucks. Daytime television or morning shows include more "soft" news and feature pieces, while the evening news emphasizes "hard" news. News anchors (formerly "anchormen") serve as masters-of-ceremonies and are usually shown facing a professional video camera in a television studio while reading unseen teleprompters. The anchors are often in pairs (co-anchors), who sit side by side and often alternate their reading. Meteorologists stand in front of chroma key backgrounds to describe weather forecasting and show maps, charts and pictures. Reporters research and write the stories and sometimes use video editing to prepare the story for air into a "package". Reporters are usually engaged in electronic field production (EFP) and are accompanied by a videographer at the scenes of the news; the latter holds the camera. the videographer or assistants manage the audio and lighting; they are in charge of setting up live television shots and might edit using a non-linear editing system (NLE). Segment producers choose, research and write stories, as well as deciding the timing and arrangement of the newscast. Associate producer, if any, specialize in other elements of the show such as graphics. Broadcast journalism is changing rapidly, causing issues within the business as well. Many people can no longer find jobs in broadcast journalism because much more is online and does not even need to be broadcast by a person. Others are being laid off to invest more money into new technologies. Other changes include innovations allowing TV stations to better alert viewers in emergencies and have higher quality services. Convergence is the sharing and cross-promoting of content from a variety of media, all of which, in theory, converge and become one medium. In broadcast news, the internet is a key to convergence. Frequently, broadcast journalists also write text stories for the Web, usually accompanied by the graphics and sound of the original story. ​Websites offer the audience an interactive form where they can learn more about a story, can be referred to related articles, can offer comments for publication and can print stories at home. Technological convergence also lets newsrooms collaborate with other media, broadcast outlets sometimes have partnerships with their print counterparts. Citizen broadcast journalism is a new form of technology that has allowed regular civilians to post stories they see through outlets such as Snapchat, Facebook, and Twitter. It has become a new trend that some allegedly fear will take over broadcast journalism as it is known. News companies, like Fox News, are employing citizen journalists, which is a new phenomenon among journalism. The term "fake news" has taken over broadcast journalism throughout the past and current years. 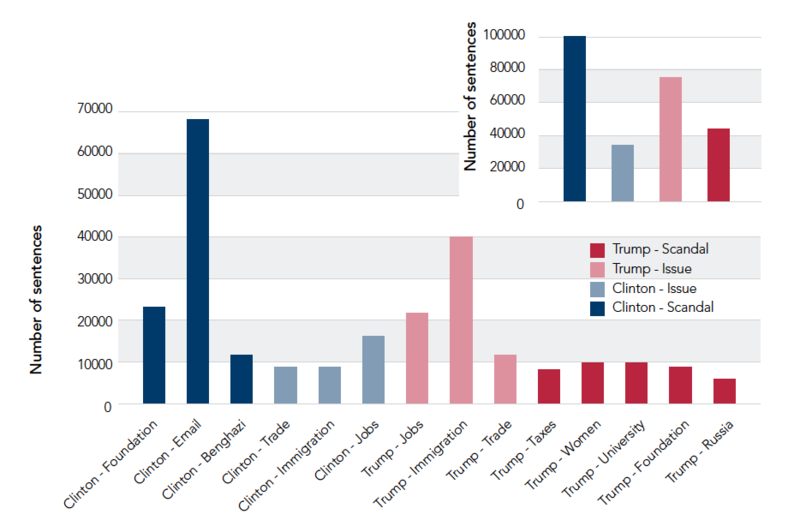 Its impact on broadcast journalism played a role in how news about the election was spread. Fake news defines how viewers see news that may be misleading or false. Many of these false or misleading stories came out during the 2016 election between Hillary Clinton and Donald Trump. ​Social media are computer-mediated technologies that allow the creating and sharing of information, ideas, career interests and other forms of expression via virtual communities and networks. The variety of stand-alone and built-in social media services currently available introduces challenges of definition. However, there are some common features. Social media use web-based technologies, desktop computers and mobile technologies (e.g., smartphones and tablet computers) to create highly interactive platforms through which individuals, communities and organizations can share, co-create, discuss, and modify user-generated content or pre-made content posted online. They introduce substantial and pervasive changes to communication between businesses, organizations, communities and individuals. Social media changes the way individuals and large organizations communicate. These changes are the focus of the emerging field of technoself studies. In America, a survey reported that 84 percent of adolescents in America have a Facebook account. Over 60% of 13 to 17-year-olds have at least one profile on social media, with many spending more than two hours a day on social networking sites. For content contributors, the benefits of participating in social media have gone beyond simply social sharing to building reputation and bringing in career opportunities and monetary income. Social media differ from paper-based or traditional electronic media such as TV broadcasting in many ways, including quality, reach, frequency, usability, immediacy, and permanence. Social media operate in a dialogic transmission system (many sources to many receivers). 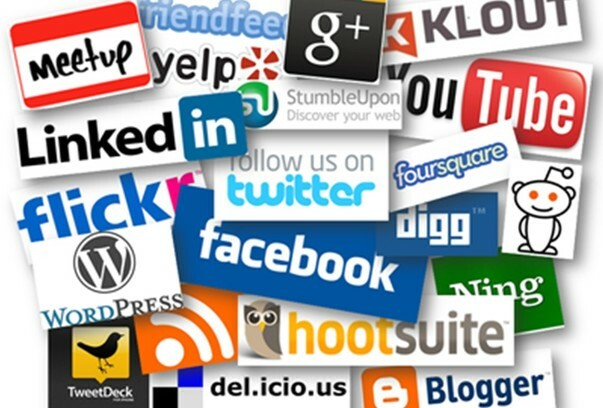 These social media websites have more than 100 million registered users. Observers have noted a range of positive and negative impacts from social media use. Social media can help to improve individuals' sense of connectedness with real and/or online communities and social media can be an effective communications (or marketing) tool for corporations, entrepreneurs, nonprofit organizations, including advocacy groups and political parties and governments. Currently, about half of young adults have been cyberbullied and of those, 20 percent said that they have been cyberbullied on a regular basis. Another survey was carried out among 7th grade students in America which is known as the Precaution Process Adoption Model. According to this study 69 percent of 7th grade students claim to have experienced cyberbullying and they also said that it is worse than face to face bullying. For an alphanumerical List of Blogs, click here. For a Glossary of Blogging Terms, click here. In the 2010s, "multi-author blogs" (MABs) have developed, with posts written by large numbers of authors and sometimes professionally edited. MABs from newspapers, other media outlets, universities, think tanks, advocacy groups, and similar institutions account for an increasing quantity of blog traffic. The rise of Twitter and other "microblogging" systems helps integrate MABs and single-author blogs into the news media. Blog can also be used as a verb, meaning to maintain or add content to a blog. The emergence and growth of blogs in the late 1990s coincided with the advent of web publishing tools that facilitated the posting of content by non-technical users who did not have much experience with HTML or computer programming. Previously, a knowledge of such technologies as HTML and File Transfer Protocol had been required to publish content on the Web, and as such, early Web users tended to be hackers and computer enthusiasts. In the 2010s, majority of blogs are interactive Web 2.0 websites, allowing visitors to leave online comments and even message each other via GUI widgets on the blogs, and it is this interactivity that distinguishes them from other static websites. However, there are high-readership blogs which do not allow comments. The ability of readers to leave comments in an interactive format is an important contribution to the popularity of many blogs. However, blog owners or authors need to moderate and filter online comments to remove hate speech or other offensive content. Most blogs are primarily textual, although some focus on art (art blogs), photographs (photoblogs), videos (video blogs or "vlogs"), music (MP3 blogs), and audio (podcasts). Microblogging is another type of blogging, featuring very short posts. In education, blogs can be used as instructional resources. These blogs are referred to as edublogs. On 16 February 2011, there were over 156 million public blogs in existence. On 20 February 2014, there were around 172 million Tumblr and 75.8 million WordPress blogs in existence worldwide. According to critics and other bloggers, Blogger is the most popular blogging service used today. However, Blogger does not offer public statistics. Technorati has 1.3 million blogs as of February 22, 2014.